Description: Salvia greggii, commonly referred to as Autumn, Cherry or Gregg Sage, usually grows into a mounding shrub 2-3 ft. tall and 2-3 ft. wide, although an occasional plant may reach 5 ft. tall. It has ½ to 1 inch green, smooth, aromatic leaves and is evergreen during most North Texas winters. The species name honors naturalist Josiah Gregg (1806-1850), discoverer of Texas plant species in the 1840s. 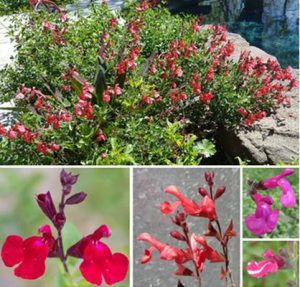 Autumn Sage is native to Central, West and South Texas where it grows in rocky soils. It is popular in landscapes, with cultivars that vary in flower and leaf color, bloom time and growth habit. Flowers and Seeds: Despite its name “Autumn,” S. greggii blooms from March through frost; the timing of the biggest flush of flowering depends on the variety. Cultivars with red, pink, orange, coral or purple blooms exist, some with white variegation. The 1 inch individually short-lived flowers are borne on racemes, soon replaced by new buds opening. Small seeds may be harvested from the dried seed capsules. Planting sites: Full or partial sun is ideal for Autumn Sage. Although it grows well in a wide variation of garden soils, it is intolerant of poor drainage, especially in clay soils that shrink and swell. Watering Instructions: Autumn Sage should be watered when first planted. Once established, it is extremely drought-tolerant. Comments: Autumn Sage’s thick foliage makes it useful as a small shrub, or low hedge with several planted in a row. Although not necessary, Autumn Sage’s branches are easily pruned in the fall. They are also somewhat brittle, making it better suited for areas away from where they will frequently be brushed against, though doing so it releases a heavenly aroma. For red to orange varieties, Autumn Sage’s aromatic foliage may be used to flavor food or teas and the flowers are edible. Its flowers serve as a nectar source for bees and butterflies and attract hummingbirds. Companion plants include Red Yucca (Hesperaloe parviflora), Blackfoot Daisy (Melampodium leucanthum), Sundrops (Calylophus berlandieri), Zexmenia (Wedelia acapulcensis), Prairie Verbena (Glandularia bipinnatifida), and various milkweeds (Asclepias spp.). Consider planting Autumn Sage instead of exotic perennial shrubs like Indian Hawthorn, Abelia, Nandina, Dwarf Burford holly and Japanese Boxwood species. Dedicated to the memory and wisdom of Shirley Lusk.